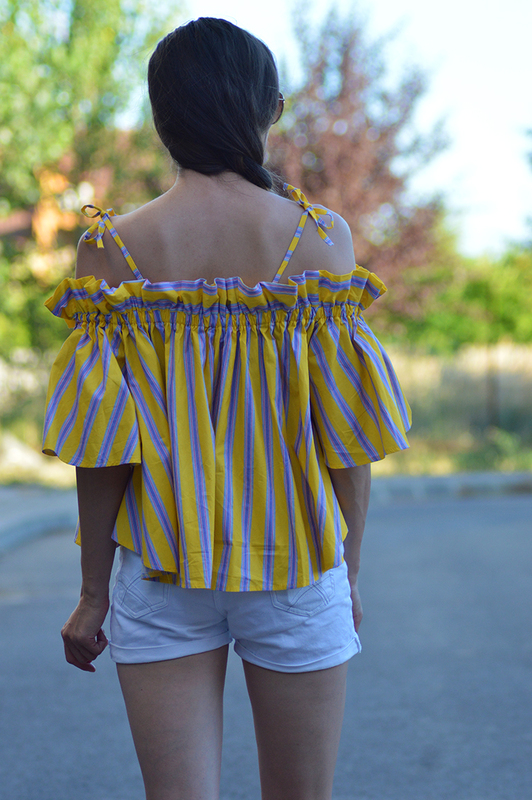 I don'y have a great relationship with the color yellow. In fact I think it's my least favorite color. I wouldn't use such a strong word as "hate" to describe my feelings towards it, but it's not far from that either. Even so, once in a while I find myself inexplicably drawn to this color and here I am ordering this and that off the internet. 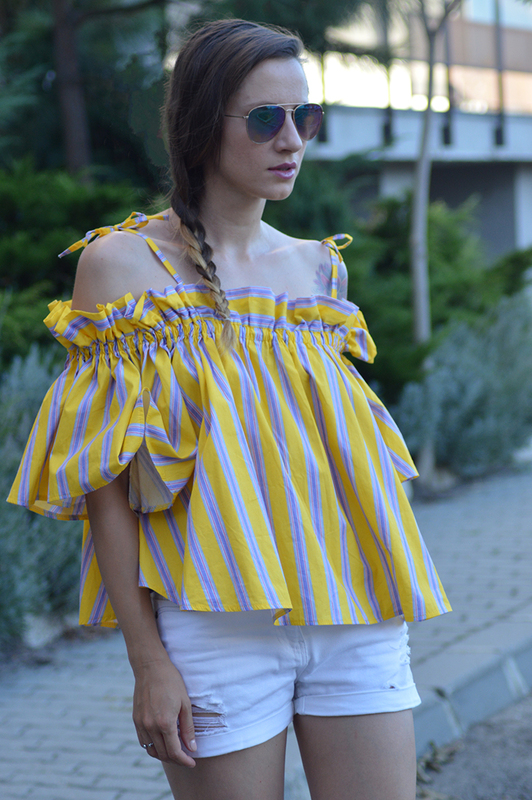 This time I fell for this striped off shoulder shirt, mostly because I am obsessed with anything off the shoulder (somebody stop me!) but also because I wanted to take a risk color wise and step out of my comfort zone. I regret nothing! 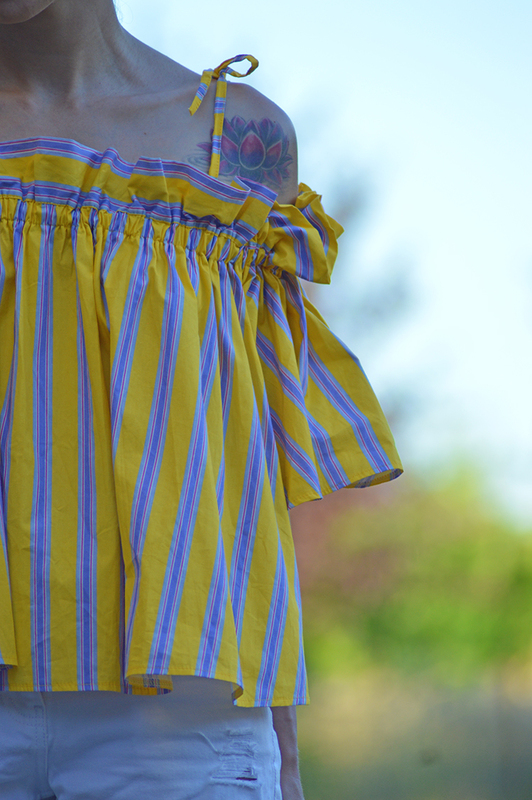 This is not something I would normally wear but I am glad I made a change, and this shade of yellow looks great against the blue stripes. Makes me think of the sun up in the summer sky. This is something I wore out on a stroll with the kiddo, so comfort was a must. I just threw on a pair of white cut off denim shorts, I cut them myself last year I think, and they are one of my favorite pair, comfy flat sandals and sunnies. The shoes bring an unexpected pop of color which ties everything in nicely. I like the summer-ish vibe of the outfit! The outfit that you are wearing, looks perfect on you and it is increasing look for your personality. Thanks for sharing. Outstanding look in this outfit. I like yellow color, I have many yellow things at home. Also, the emblem of my app store optimization company have the yellow color.